Amazing Benefits Of Applying Ice Cubes On Face. In the hot summer months, which constitute most time of the year, ice comes as such a relief. Using ice cubes for face not only soothes breakouts and pimples but also helps relieve of sun burn and rashes. The chilly and cold cubes when applied on the face also help in boosting the skin complexion and texture by regulating blood circulation. Ice cubes are also a great help in a bid to prevent premature aging and its signs like wrinkles, fine lines and blemishes to a large extent. In summers, our skin takes a severe beating due to increased temperatures and sweating and hence, ice cubes do come as saving grace. Also for those suffering from oily and combination skin have to suffer many skin problems and hence, ice cubes naturally help in keeping the skin fresh and free of infections by flushing out excess oil that accumulates dirt and bacteria. Overall, by just applying ice on face, one can be assured of a radiant and glowing face ready for the sweaty and dull summer. Ice cubes are known to help shrink and minimize acne and pimples. The ice works to numb and stop the growth of fungi and bacteria on the acne, thereby reducing and gradually healing it. It also relieves of the pain caused by the pimple. Ice for face is also good for reducing inflammation which can be caused due to a bad allergic reaction or over sensitivity of the skin, especially during summers. For immediate effect, make sure to apply lemon juice on the acne and then rub ice as it helps disinfect the skin as well. Apply on the face, gently massaging for 5-10 minutes and feel instant freshness. Massaging ice on face also cleans the dullness and dryness of skin and boosts blood circulation immensely. A good circulation of blood on the face makes the skin look bright and smoldering. Rubbing ice on face also helps in improving the complexion and texture of the skin naturally. Make sure to break 2-3 mint leaves into pieces and freeze them with water and then apply on the skin for season’s best blush. In summers we mostly suffer from sunburn on our face the moment we go out. Harsh Ultraviolet rays of the sun penetrate into the inner layers burning them instantly. Hence, one of the best benefits of ice on face would be to get rid of the painful sun burns. Ice provides a cooling effect on the skin, thereby soothing the affected area. One can easily make aloe vera cubes at home for a quick and sure-shot relief. Just collect fresh Aloe Vera leaf, remove the skin and take out the green gel. Now cut into small pieces and freeze the Aloe Vera pieces. To use wrap in a thin muslin cloth and massage gently all over the face and see it working wonders for sun burnt skin. In summers we also tend to get tired very easily and the effect can be shown on face. Apart from insipidness on the skin, we also see puffy and worn-out eyes. Also, less sleep and more work in front of computers or television is the reason for bulbous and swollen eyes. As the skin around eyes is very delicate, it tends to swell and so applying ice on face and areas around eyes can help relieve the problem. One can easily freeze many herbs like Lavender along with water and rub along the eye area to over the puffy eyes problem in no time. When we think is rubbing ice on face is good or bad, most skin specialists believe that ice cubes could be the best natural ingredient for the health of skin. They can be the cheapest scrub and exfoliant as well for the skin. 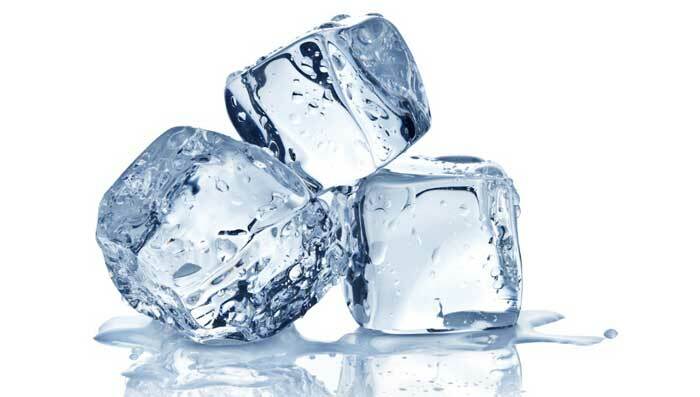 Ice not only scrubs away dead skin cells but also promotes healthy growth of new cells and follicles. And the best news is that ice is beneficial for all kinds of skin. It also gives the skin a face lift. For a natural scrub, just soak few almond overnight and next day blitz them in a grinder to make a paste. Thereafter, freeze them in cubes and scrub away to a beautiful skin. In summers, due to easily getting worned out, skin faces lot of problems including pre-mature aging. Signs like wrinkles, fine lines, crow’s feet and blemishes start appearing to our horrors. While wrinkles are unavoidable as we age, but using ice cubes on face every day, we can at least delay them. Ice keeps the skin well hydrated and tightens it, locking in the moisture. This helps in cells regaining their elasticity and one feels a younger and fresher looking skin. For treating wrinkles in the long run, take some raw milk and freeze it into cubes. Apply first thing in the morning for at least 5-10 minutes massaging gently and then wash off with cold water. Whenever we do make up, there are a host of artificial, chemicals-laden elements we apply that cause harm to the skin in the long run. But applying ice on face helps in keeping the make-up intact for a longer time. It also can easily be swapped with expensive primers that are layered on the skin to strengthen and solidify the make-up. Ice minimizes skin pores and helps it breathe easy. Those who have oily skin suffer the most during summers. Excess oil in the skin pores not only makes it dirtier but also accumulates lot of bacteria and fungi that cause pimples and acne. So, one of the best benefits of rubbing ice on face includes getting rid of excess oil secretion and making it look and feel young, supple and fresh. Open skin pores in summers are the worst skin condition. They accumulate dirt and bacteria and cause inflammations and breakouts. They are form blackheads and white heads which cause a lot of other skin issues. Hence, rubbing ice on face can help reduce and close the pores and keep it clean. Not many people know that one of the best uses of ice is for skin whitening. It helps in brightening the skin complexion, making it look radiant. You can always freeze some fresh cream and apply on the face for quick whitening and brightening. Apart from soothing puffy eyes, ice cubes are also helpful in overcoming dark circles. By just keeping two slices of cucumbers and ice cubes on closed eyes for 10-15 minutes every year, one can get relieved of the problem, faced by most of us. The fastest way to get rid of dark circles is to make a green tea concoction and fill it in ice trays and freeze overnight. Next morning, apply on the dark circles, gently massaging for 10 minutes and feel the difference within a week. While regularly applying ice on the face can do wonders for the skin, there are also many points one needs to take care while doing so. It is very important to note that one must not rub the ice cubes on face for more than 10 minutes as there are delicate and fragile capillaries under the skin layers which can easily break after getting numb. Make sure while applying ice on face always wrap them in a cotton cloth and rub for best effects. For skin brightening, always mix water with various herbs, and fruits and freeze it while applying on the skin. Also those suffering from allergy should take care while rubbing ice on face. Those who have flared up rosacea may worsen their skin condition and hence should always consult a doctor before doing so. Do not use ice cubes on the face immediately after coming from sun as it may shock the delicate skin.